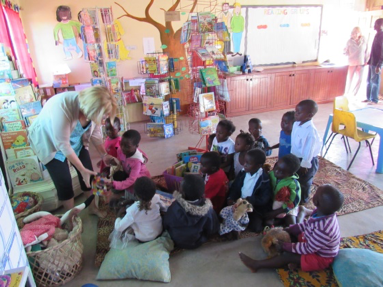 Safari on the River helped build this library at Uyoba School in Mfuwe Village, Zambia where board member Debbie Lott volunteered to organize and teach for three months. We were there in June, and we were thrilled to watch Debby’s gifts of experience and pure joy in loving what she does pay off. With no Internet or social media to announce that the library was open to the public, many children under the age of five were waiting by the door each day. They learned skills that will help them in school when they are old enough to attend. The library is inviting and comfortable, and children are passionate about learning. We’re grateful for your support, and Debbie’s boundless energy and willingness to live in the community and help provide a brighter future for these young people. About six years ago, Africa Hope Fund provided Uyoba School with Zambian reading textbooks called Happy Readers thanks to our supporters. Word spread throughout the village, and attendance exploded from about 350 students to more than double that in a few years. Over the past six years, Africa Hope Fund added new classrooms to help with crowding, bought furniture, got a field graded for soccer, and as we left, was installing electricity at the school. Soon students will be able to connect with the outside world and learn using electronic tablets for classes. We know that educating the youth will help them get secure jobs and help value their heritage, the wildlife that surrounds them. Tickets for this year’s fundraiser, Safari on the River (safariontheriver.com) are going fast. Join us on Sunday, September 18th and get a taste of Zambia without the jetlag. Shop in our authentic Zambia gift shop, meet Rachel McCobb and Benson Kanyembo of Conservation South Luangwa and learn more about their work and how the detection dogs we help provide are saving Zambia’s wildlife.